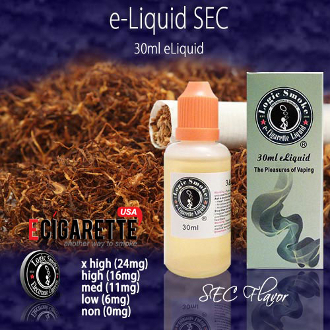 Our SEC E-Liquid from Logic Smoke is a wonderful addition to your tobacco flavored e-liquid collection. It is smooth and mild and the flavor is modeled after a cigarette brand popular years ago. Grab yourself a bottle of Logic Smoke SEC E-liquid and add to your collection. This allows you to choose the perfect amount of nicotine to suit all of your vaping needs. Feel free to mix the different nicotine levels together. By doing this, you can create intermediate levels of nicotine as well. This allows for a more gradual reduction in your nicotine level, if this is what your ultimate goal is. For example, if you find a 24mg to be a bit too much for you, or you are just ready to reduce your nicotine to a lower level, but you find a 16mg not enough, do a 50/50 mix of the of the 24mg nicotine and the 16mg nicotine levels. Combine them in your clearomizer or other atomizing device and you can create an "intermediate level" of 20mg. 16mg plus 24mg = 40mg / 2 = 20mg. Same formula for the other levels. 11mg plus 6mg = 17mg / 2 = 8.5mg. Experiment and decide what is best for you. You'll truly enjoy the mild taste of the Logic Smoke SEC e-liquid. Happy vaping! !